Flow charts and information design. Those have always been two of my most favorite types of projects to work on! Organizing and compartmentalizing are among the things I do best. In fact, if you were to peek into my design laboratory at home or my desk at work, you'd immediately see that I am a little psycho about it making sure things are in order. 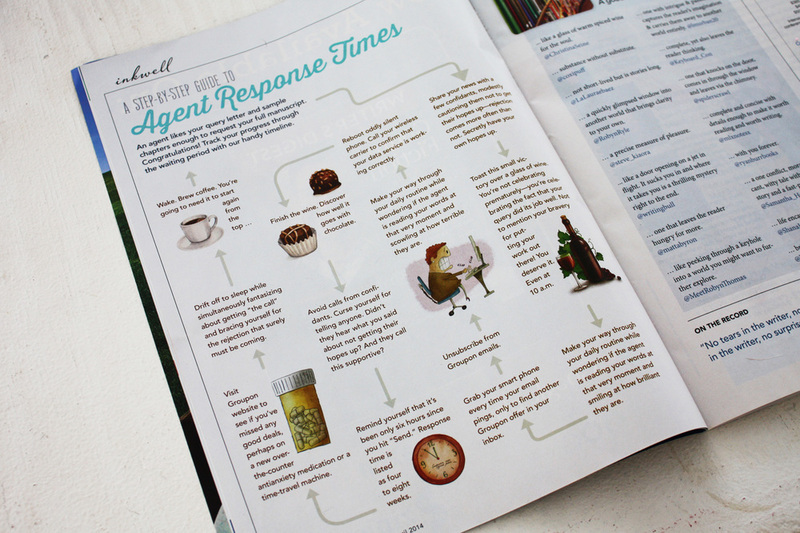 This flow chart is featured in the March/April issue of Writer's Digest, and I'm pretty excited about it! I generally take care of all design needs for the magazine (new feature package designs/concepts for every issue, column design, etc. ), but I've never had the opportunity to design a flow chart for WD before. This piece is titled A Step-By-Step Guide to Agent Response Times. It's a lighthearted take on the thought process of a writer as he or she nervously goes through the (beginning stages) of the publishing process. It's very humorous and I think all of us (writer or not) can relate to it on some level!